I should probably admit that I’m a little bit obsessed with chocolate Cakes, haha! But let’s be honest, who doesn’t love chocolate? Especially when it’s paired with Peanut Butter because this combo is my most recent addiction! Whether I put it in a creamy oatmeal, or use it as topping for pancakes, either for breakfast or for dessert – it always comes right! 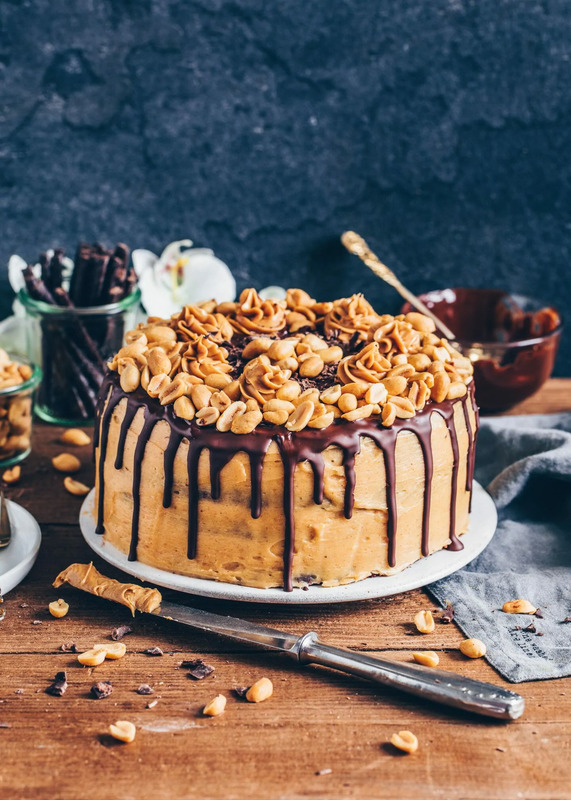 And since my Brownie Cheesecake was so delicious, I wanted to create another Cake with that heavenly Peanut Butter Chocolate combo. 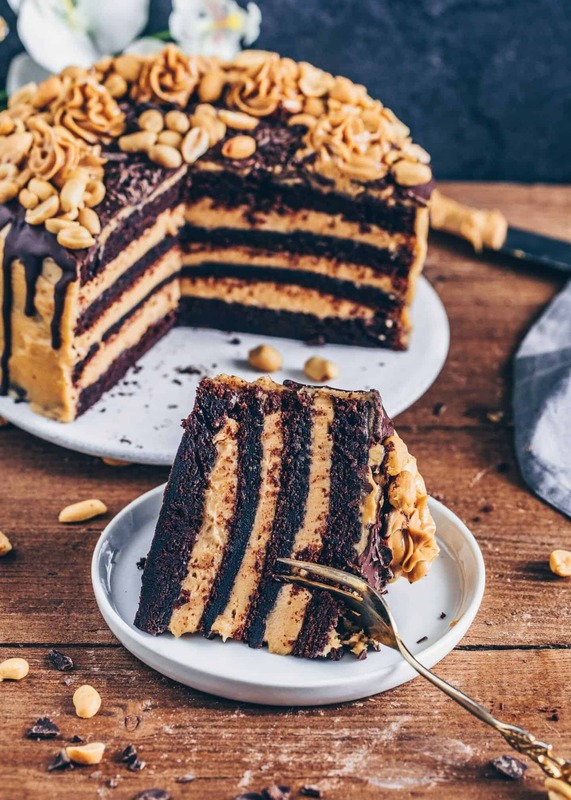 As for the little story behind this creation, my friend Sabine (@alsothecrumbsplease) inspired me to assemble my Chocolate Peanut Butter Cake this way. 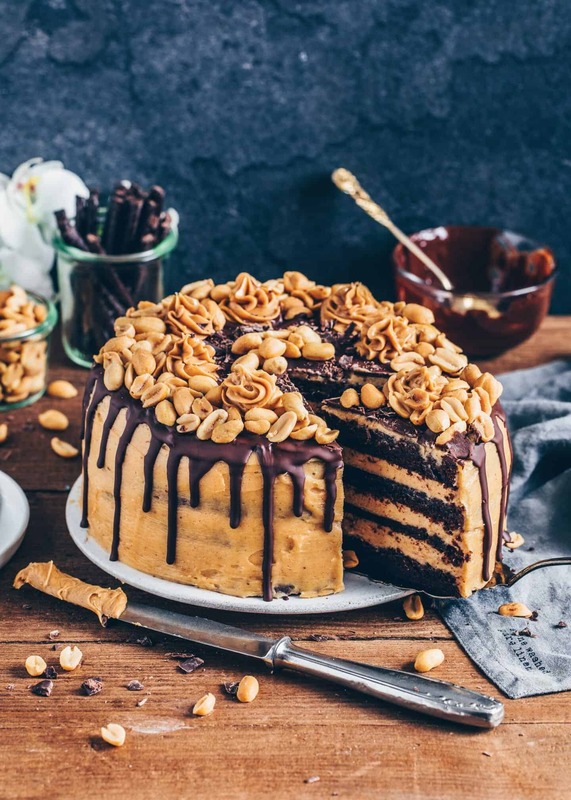 When she shared her gorgeous Chocolate Peanut Butter Cake, I immediately fell in love with the styling and wanted to create the vegan version of hers. She’s a very lovely person, by the way, and will also start doing workshops soon! 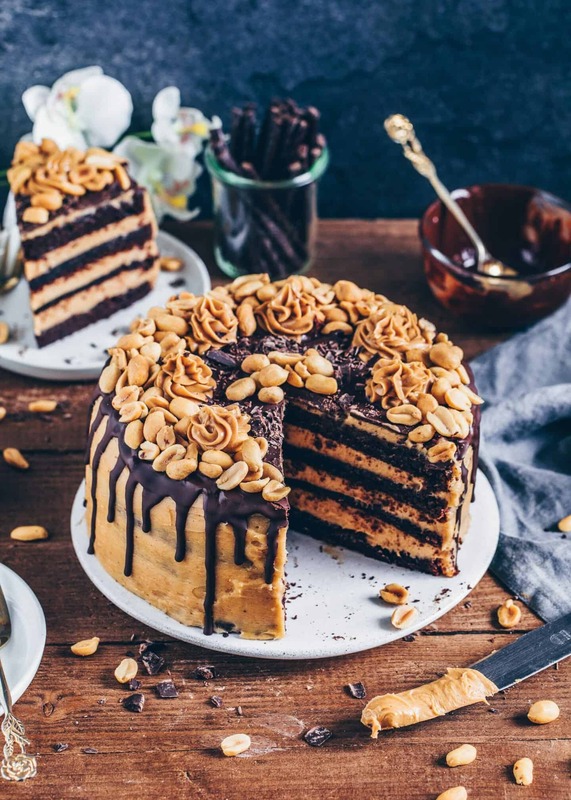 Making this vegan chocolate cake is very easy! Start by stirring the vinegar into the non-dairy milk and set aside to create vegan buttermilk. Then simply combine the wet and dry ingredients. Pour it into your prepared cake pans and bake! That’s it! Actually, this recipe is pretty similar to my Best Vegan Chocolate Cake that I shared a while ago here on my blog. I just changed a couple of things to make it more moist and flavorful. For example, I also added applesauce which gives this cake more moisture and brings out the fudginess. Also, I added a bit of strong brewed coffee because it tastes absolutely amazing in this Chocolate Cake! Anyways, if you don’t want to add coffee, you can also substitute more non-dairy milk or water instead. Make sure not to overbake your Chocolate Cake! If you want a soft and moist Chocolate Cake, it is very important to have the right oven temperature and not to overbake it! I’ve figured out that most ovens often vary in temperature, so if your oven is not accurate and it’s hotter than it shows, your cake will probably get overbaked. In this case, it will get dry and crumbly instead of soft and moist. Anyways, you don’t have to buy a new expensive oven because of that, but I recommend you to test your cake with a skewer to avoid overbaking. So when a toothpick in the center comes out clean, you can remove it. Otherwise, as another option, you can also buy an oven thermometer to make sure your oven has an accurate temperature. While buttercream is often made with just butter and sugar, I made mine a bit “healthier” and used non-dairy cream cheese instead of butter. This not only reduces the amount of fat but it also makes it creamier and lighter in taste. Just in case you can’t find non-dairy cream cheese, it is absolutely okay to use coconut cream instead. And don’t worry, you won‘t taste the coconut flavor because the peanut butter and the chocolate will definitely overpower it. 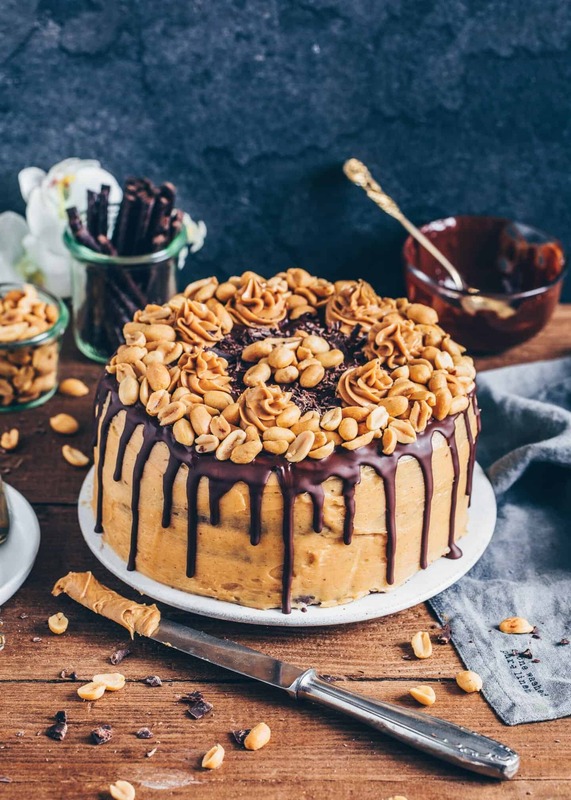 Making the creamy peanut butter frosting is very easy! Simply mix the soft vegan cream cheese with a handheld mixer until creamy. Then stir in the creamy peanut butter and vanilla and sift in powdered sugar. The peanut butter frosting should become very creamy and spreadable during mixing. If it is too firm, you can add a tiny bit of non-dairy milk. And if it is too soft, you can add more powdered sugar. The perfect Cake to impress your guests! The perfect Chocolate Cake for any occasions! 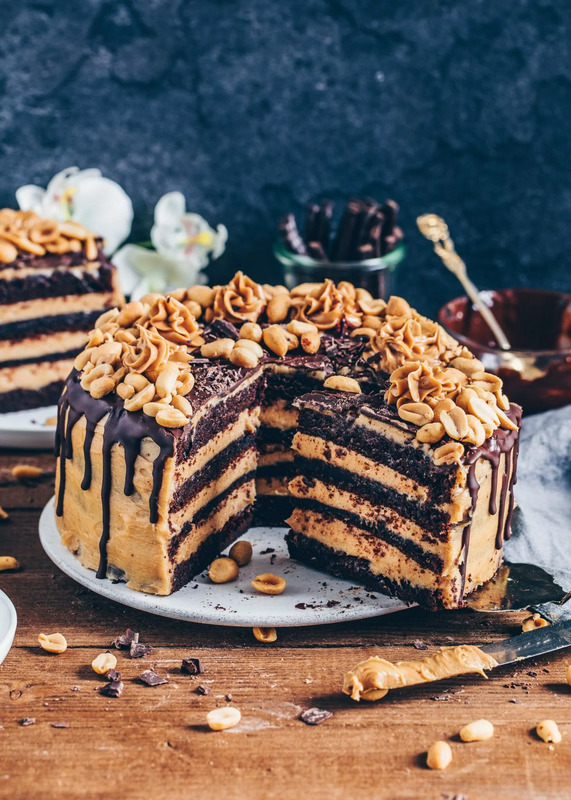 This chocolate cake is great for birthdays, cozy afternoons, or any other occasion when a rich and delicious chocolate peanut butter cake is welcome. So basically all the time and every day, haha. 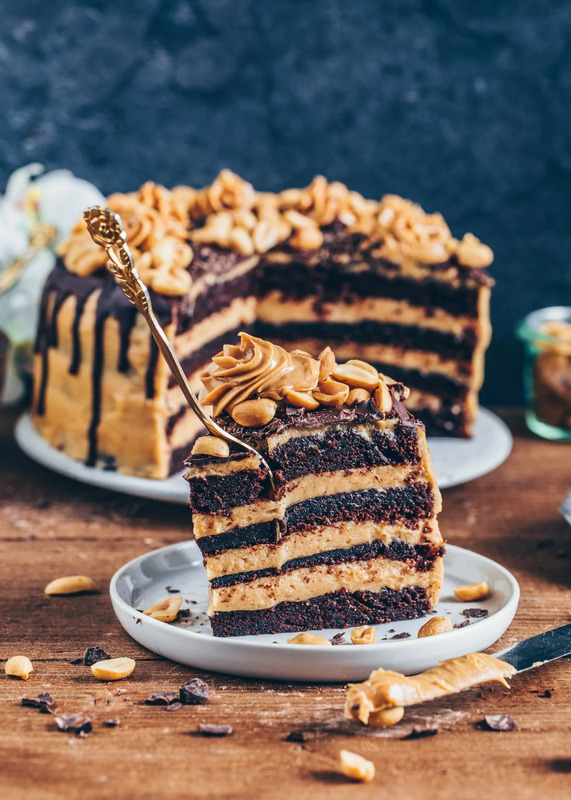 And if you are looking for more Vegan Cake Recipes, you can also check out my Best Vegan Chocolate Cake, Brownie Cheesecake, Vegan Brownies, or one of my favorite Vegan Cheesecake and Vegan Crumble Cake Recipes. 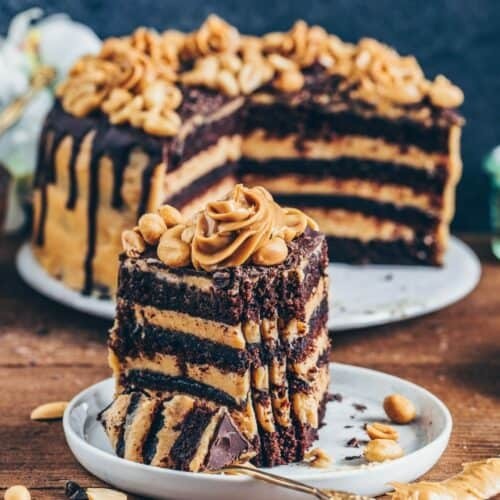 This Chocolate Peanut Butter Cake tastes almost like a Snickers Cake! 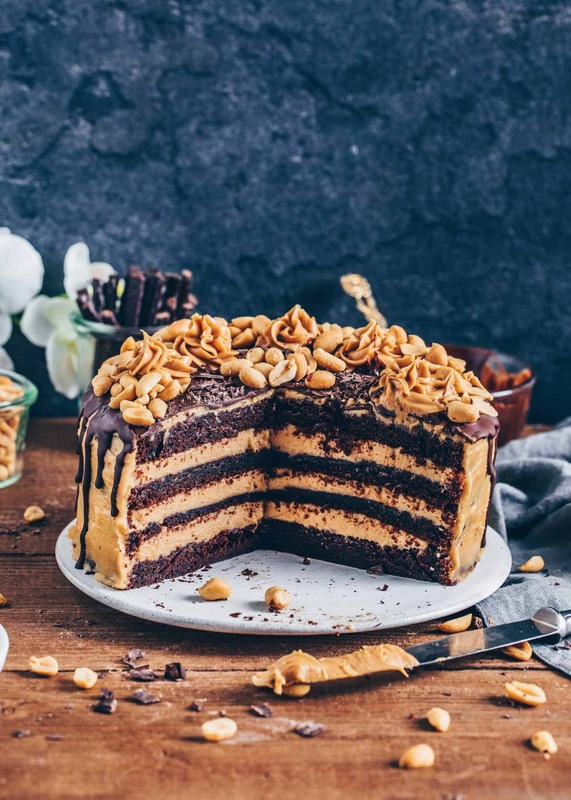 It is a soft and moist vegan chocolate cake that is filled with a rich and creamy peanut butter frosting. It’s a delicious recipe and makes the perfect dessert for a birthday or any occasion! Preheat oven to 350˚F (175˚C) and grease two 8-inch (20cm) cake pans. (You can also line them with parchment paper for easier removal). In a measuring jar, add non-dairy milk and vinegar. Stir to combine and set aside until it curdles to create vegan buttermilk. Sift the flour, cornstarch, sugar, cocoa powder, baking powder, baking soda, and salt into a large bowl and give a good whisk to combine. Add the melted coconut oil, applesauce, vanilla, and vegan buttermilk. Mix on medium speed using a handheld mixer until well combined. Lower the speed and pour in the coffee, continuing to mix until combined. (If you like the cake sweeter, add more sugar to taste). Divide the batter evenly into the prepared cake pans. Bake for 30 minutes, or until a toothpick inserted in the center comes out clean. (Please do not overbake, if you want a moist chocolate cake). After baking let the cakes cool for 10 minutes in the pan, then remove and let them cool completely before frosting. Mix the non-dairy cream cheese with a handheld mixer until creamy. Then stir in creamy peanut butter and vanilla. Sift in powdered sugar and mix until well combined and creamy. (If it’s too firm and not spreadable, stir in a bit of non-dairy milk. If it is too soft, add more powdered sugar). Cut the cakes horizontally in two equal layers. Place one cake layer on a serving plate. 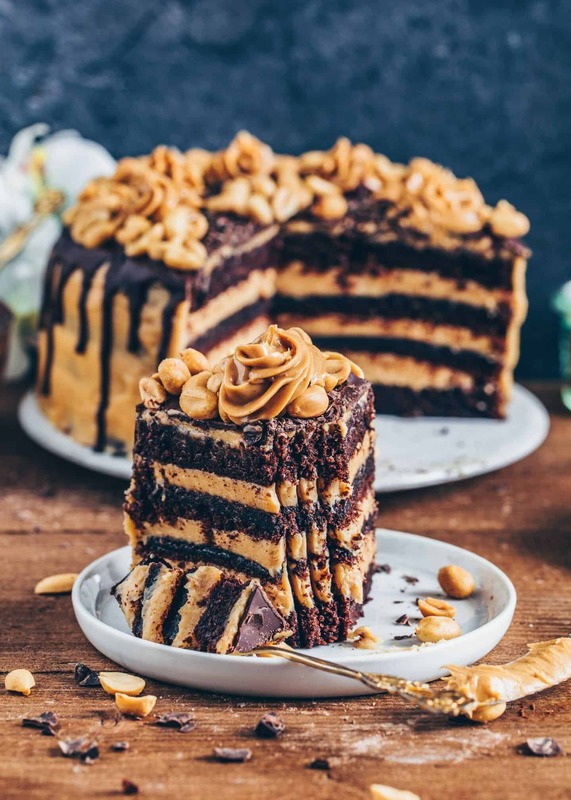 Spread about 1/4 of the peanut butter frosting in an even layer over the top, then place the second cake layer on top and repeat this step with the 2 following layers. Place the last cake layer on top and spread remaining frosting all over the top and sides of the cake. (Optionally, save a small portion of the frosting for the decoration and fill into a piping bag). Chill the cake at least 4 hours in the fridge or overnight. Slowly, melt the chocolate over a water bath (or microwave), stirring occasionally. Add a bit of non-dairy milk, stirring to combine until smooth and creamy. Let cool slightly, then carefully, spoon melted chocolate around the sides with a teaspoon, and let it drip off. Pour the rest of the melted chocolate on top of the cake, smoothing out evenly. Place the cake in the fridge for 5 minutes or so to firm up. 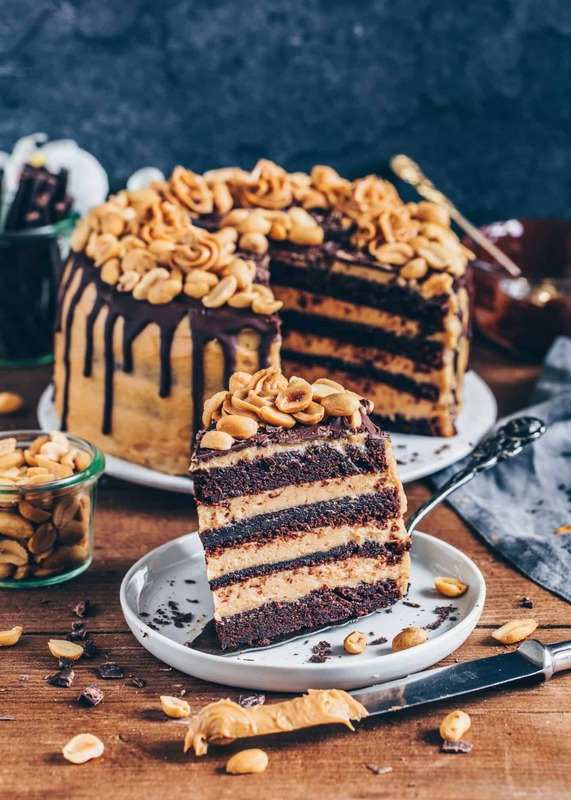 Optionally, make pipes on top of the cake with the remaining peanut butter frosting and decorate with salted peanuts! To make this cake gluten-free, I recommend using a gluten-free flour blend 1:1. To make this cake reduced in sugar, you can use a sugar substitute or coconut sugar. Instead of using cream cheese, you can also make the buttercream frosting with 1/2 cup vegan butter (mix until creamy), then add 1 cup coconut cream (mix again) and stir in 1 cup creamy peanut butter + vanilla. Sift in powdered sugar and mix again until creamy. Simply refrigerate a can of coconut milk overnight. Then scoop out the solid part from the can which should have the same consistency as cream cheese (this is the coconut cream). Please make sure to use CREAMY peanut butter and no oily! Otherwise, your frosting will be too runny. 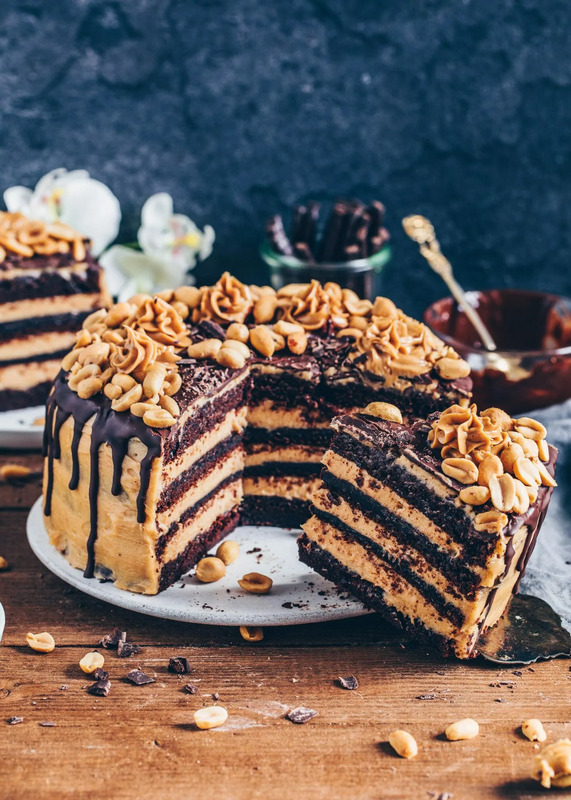 You can keep leftover cake covered in the fridge for up to 3-4 days, or you can freeze the un-frosted cake for up to 1 month. You can also turn the batter into cupcake or muffins. Fill the pans 2/3 full and bake for 20-25 minutes. 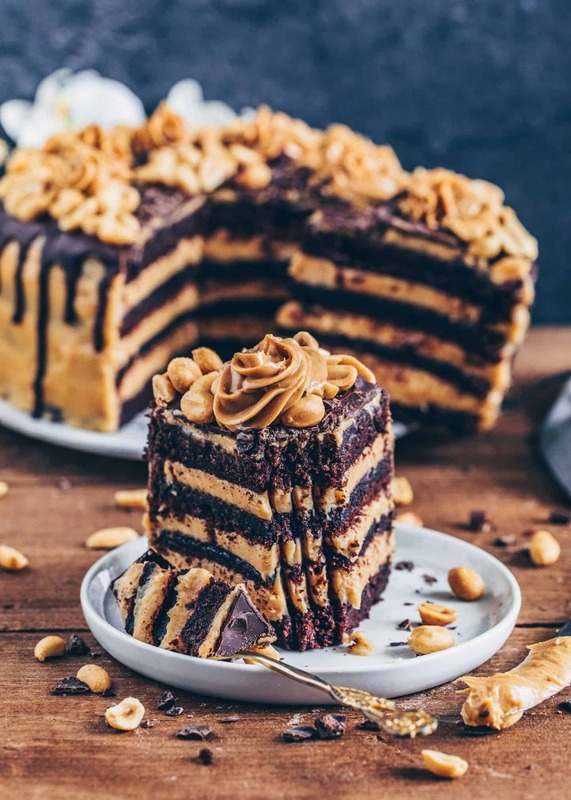 If you’re making this cake without the peanut butter frosting, you can top it with a simple chocolate frosting or enjoy it plain. 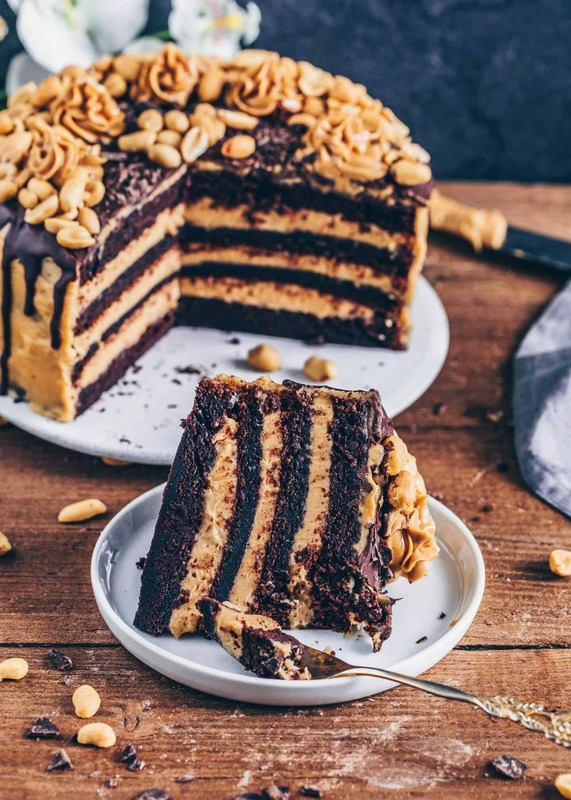 It also tastes delicious when you serve a scoop of vegan ice cream, coconut yogurt or whipped coconut cream and a drizzle of caramel sauce on top of your slice. Bianca, that cake is stunning! I love just everything about it. You make me so curious about vegan baking that I have to try your cake. A masterpiece! Yes, you can try that! The texture will be like a peanut butter mousse then. Just make sure to use creamy peanut butter and no oily. This cake looked so beautiful I had to give it a try! I didn’t have any cream cheese so I went with the second frosting option with the coconut cream and butter, however it turned out very wet. Maybe I didn’t get all of the water out of the coconut cream, or perhaps the “natural” style of peanut butter is too oily. I found that I had to dab the frosting with paper towels in order to work with it, and when trying to pipe it fell apart. I did add extra powdered sugar to try and absorb some of the liquid but the frosting just wouldn’t come together for some reason. Other then that cake cake out beautiful! I’m so sorry to hear that. It is very important to use only the firm part of coconut milk. It should be as firm as cream cheese. Also, the peanut butter must be creamy. If you want to try it again, please make sure to buy CREAMY peanut butter and no oily. 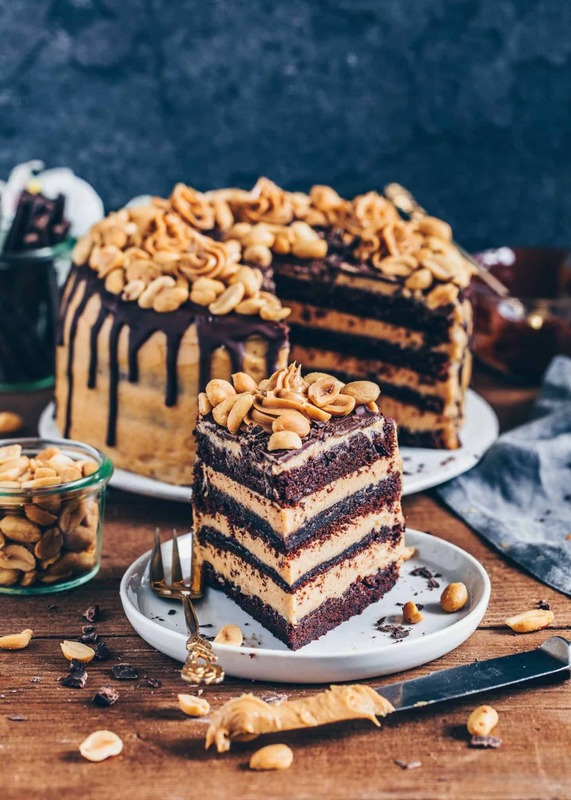 I actually want to make it with dairy products, I’m trying to adopt a plant based diet but my family prefer dairy based at the moment although we are all egg-free, would it be possible to swap the plant based ingredients with the dairy/cow’s milk alternatives and get the same results? So ein tolles Rezept! Habs gleich ausprobiert,.. nur die creme abgewNdelt mit fruchtpulver ! !